03/1/2005 Copyright © 2008 James William Shine, Jr. The Fender Jazzmaster existed in prototype and pre-production forms as early as fall 1957. There were a small number of guitars that carry one off features. Many had one-piece maple necks that feature a headstock shape that is a hybrid of the first style Jazzmaster and Stratocaster headstock shapes. Many of these also feature a plain "Fender" decal cut from a steel guitar, or Musicmaster family decal. Other early one off features seen is black pickup covers, black lacquered aluminum pickguards, Telecaster style knobs, and rosewood fretboards glued onto maple necks constructed with a skunk stripe. The 1959 catalog features a close-up of a Jazzmaster with tailpiece void of the "Fender" stamping, and an unusual one ply white pickguard stamped with the same screw pattern as an anodized. Many people confuse the two. There IS a difference. A true prototype is the original, handmade example from which the production tooling is based. A pre-production model is built after the tooling is created, but before the model is officially put into production. Most "Prototype" Jazzmasters on the market were built after most of the body tooling was done, making them pre-productions and not true prototypes. You can estimate the age of a pre-production based on what parts are true tooled Jazzmaster and what is hand shaped or borrowed from something else. From what I can gather, there were at least three phases of prototypes. There was the offset-body design phase. This guitar had a Strat tremolo and jackcup. It also featured a 7 pole pickup Leo was experimenting with. Likely testing the string between two poles idea he later used on Precision and Jazz Basses. Fender still owns this guitar and is in their private archive. The second phase was the pickup, rhythm circuit, tailpiece and bridge design. Freddy Taveres had this prototype. It featured a Stratocaster neck. It appears that Leo had the tooling all set up after this phase and is why we see employee guitars using these parts with odd necks. The third phase was the neck design. This is when Leo first used rosewood for the fretboard and designed the Jazzmaster headstock. The late Scott Chinery owned what was likely this prototype. The neck was originally a one piece maple neck with skunk stripe that was machined for a slab fretboard. My guess is the roots of the Jazzmaster go back to perhaps as early 1956 with body assembly designed and tooled up by mid 1957. The final phase (the neck) was not likely completed until 1958. Body and 7 pole pickup prototype Also has early odd headshape. I do not believe there is an earlier example of such a long process of R&D with so many different prototypes and pre-productions on a Fender guitar. But looking at the era the Musicmaster family, mandolin, and redesign of the P-bass as well as amplifier modifications had Leo very busy from 1956-1957. The Strat really hit the world in 1955 (not in production that long in 1954), so Leo likely was not in a hurry to get the design wrapped up allowing some time to let the world get used to the Stratocaster before unleashing the Jazzmaster. -An off set contour alder body finished in 3 tone sunburst. -A new "Pat Pend" tremolo design with a locking mechanism that allowed the player to stay in tune in the event of breaking a string. Custom Colored guitars were produced during this period of time. Fiesta Red, Blonde, metallic Gold, San Marino blue, and other 1950's colors were used. Blonde guitars featured ash bodies. Rarely a guitar will even feature gold hardware. All custom color guitars from this period are fairly rare compared to other periods of time in the models life. They are the most desirable Jazzmaster’s to collectors due to their rarity. By mid 1959, Fender dropped the aluminum-anodized pickguard in favor for a nitrate celluloid material in a faux tortoiseshell pattern. Custom color guitars often received a white pickguard. An aluminum plate was added to the back of the pickguard for shielding. Earliest shields are cut identically to the pickguard, whereas later units feature large oval openings for the rhythm roller-knobs and two- way switch. The very first batches of the celluloid pickguard guitars feature 9 pickguard screws just like the aluminum models, shortly thereafter, the number increased to 11 and then quickly to 13. To add these screws, the route for the master controls and jack was modified upon introduction of the 13-screw configuration to accommodate the extra screws. 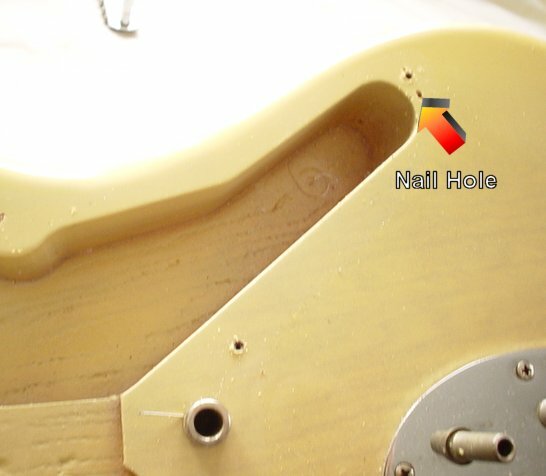 A crescent shaped notch in the pickguard was placed at the neck pocket to allow better access to the truss rod adjuster nut. 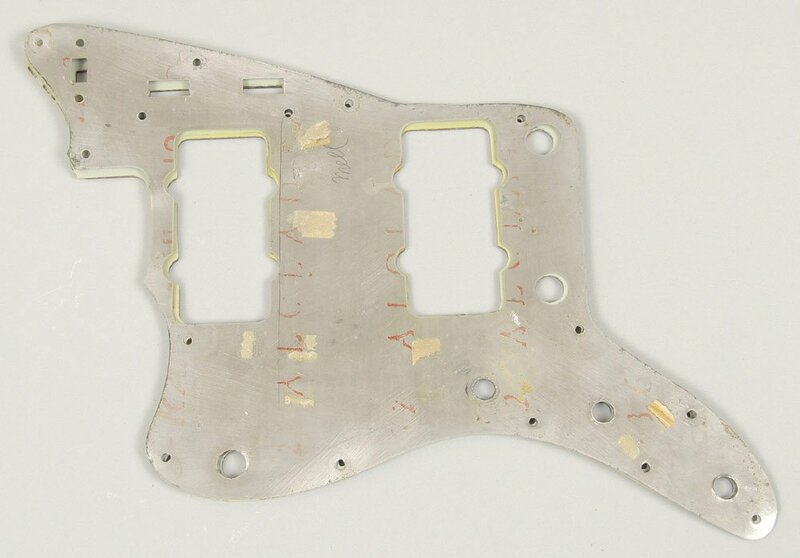 Another variance very early in the production of the Jazzmaster was the body thickness. The body thinned out before the route changed for the celluloid pickguards. Earliest bodies were the same thickness as Stratocasters and later thinned down, likely as so much wasn't really needed and helped reduce the weight. By fall 1960, the decal has three very small patent numbers added to it. The red band in most 1960 and 1961 sunbursts tends to be vary from plain red to a brick tone of brownish red. Many sunbursts from this era in fact look to be 4 tone sunbursts of blackish brown, brick brown, red, and yellow. In 1961, Fender modified the neck profile from a fairly wide "U" to a slightly smaller "C". In very early 1961 the decal had 3 patent numbers added (2,573,254 2,817,261 DES. 186,826). In the fall of 1961 the decal grew to include 5 patent numbers in a slightly larger font. Also to change during 1961 was the two way rhythm controls switch was changed to a version made by Stackpole that did not require two nuts to attach it, and the wax paper Cornell Dubilier capacitors were changed over to ceramic disk capacitors manufactured by SK. By late in the year, tailpieces are no longer stamped "Pat Pend", but rather "PAT.#2.972,923". In 1962 Fender released the Fender Jaguar. The Jaguar's basic platform was the Jazzmaster. Leo changed the scale length, some of the body design. 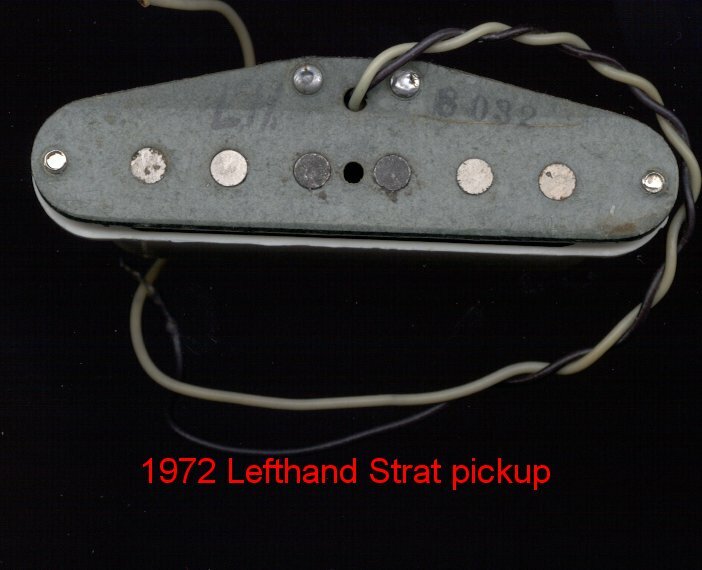 The pickups were designed narrow and with a metal “saw tooth” like claw that was made with the intention of concentrating the magnetic field, providing a punchier sound than the Jazzmaster. Metal control plates were added for visual appeal, but the Jaguar displayed Leo’s changing ideas about serviceability and ease of manufacturing. Previous models had all of the components installed to the rear of a pickguard and most of the solder work is done before going into the body. The Jaguar demanded it be wired into the guitar as each control section was surrounded with wood, only having a drilled hole for the wire to pass through. 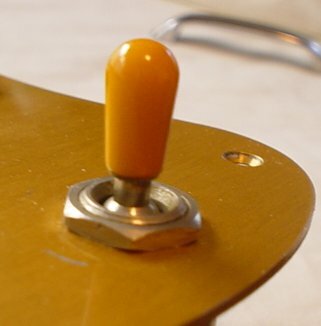 The Jaguar had a flip mute mechanism, no doubt inspired by the mutes being offered on Mosrite and Gretsch guitars. The first Jaguars were made in January of 1962 on a pre-production basis. These guitars were most likely for promotional use. March of 1962 is when the Jaguar is made in significant numbers. There appears to be a large number of custom color Jaguars made at this time, most with matching headstocks. It is clear Fender wanted to make a guitar that showed off the custom color line and the Jaguar did it in spades. The decal on the Fender Jaguar premiered with 3 patent numbers (DES 186826 PAT 2960900 2972923 & PAT PEND). Around the same time the Jazzmaster decal increased to 5 patent numbers (PAT.2,573,254 960,900 2,817,261 2,972.923 DES.186,826). 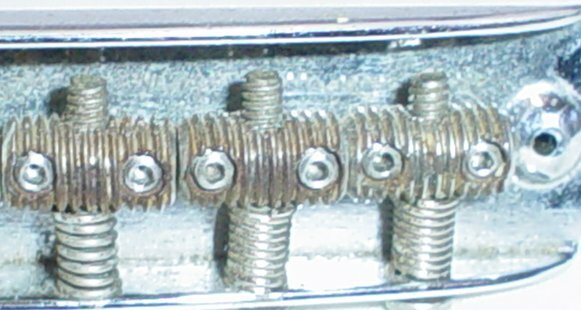 To standardize, a few of the Jazzmaster’s components were changed during the course of late 1961 to early 1962 to suit the Jaguar, the bridge mounting "thimbles" lost most of their crown to accept the Jaguar and Bass VI mute assembly, the posts on the bridge base were made slightly taller for clearance over the mute, and the tailpiece spring was made slightly softer to accommodate the Jaguar's lighter string tension. 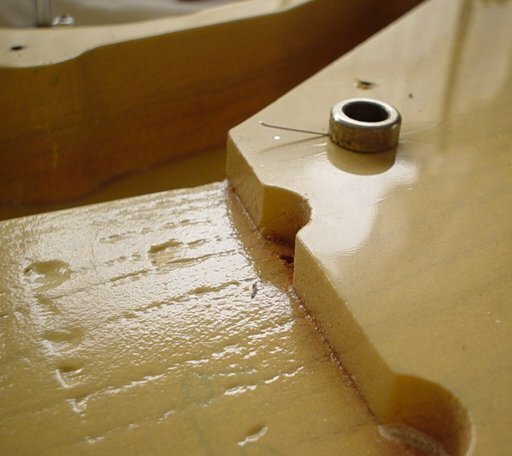 Bridge saddles began being made with finer thread on the two plain strings. The change takes almost a year of transition, with some odd bridges comprising of three or one fine thread saddles. 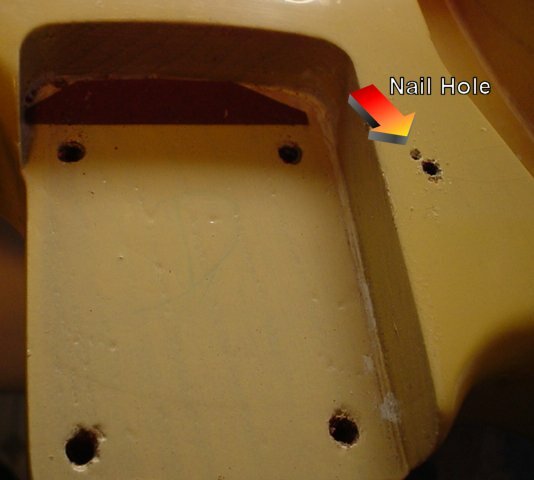 The Jazzmaster’s originally simple grounding to the strings was accomplished with piece of guitar string installed in with one of the bridge thimbles and bent to ground on the pickguard shield plate. With the introduction of the Jaguar, this was changed to a cloth wire running from the master control shield to the tailpiece cavity where it was stapled to the face of the guitar. Installation of the tailpiece contacted the wire and staple, effectively grounding to the strings. 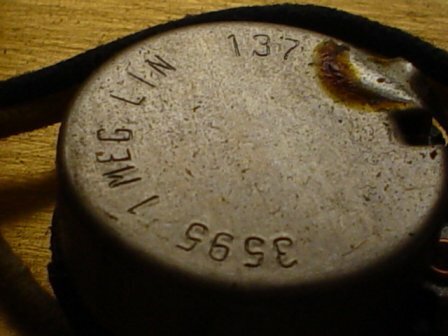 April of 1962 was the first month the necks were stamped with a code designating model, month and year of production as well as nut width. The Jazzmaster's first neck code was 4, and the Jaguar was number 1. In the course of July 1962, the slab rosewood fretboard was replaced with a carved type known as a "veneer" board. People often confuse the first number as a date of the month, but it is actually a part code. Custom color Jazzmaster's begin to show up a bit more often by this time. Matching headstocks now become standard on custom colored guitars. Fender modified its painting system by summer 1962. Paint handles were attached to the bodies during finishing, then removed and nails were installed to suspend the body during the curing process. Olympic white accounts for a fairly large percentage of guitars built in the 1963 and 1964 years. The pickups underwent a host of significant changes. 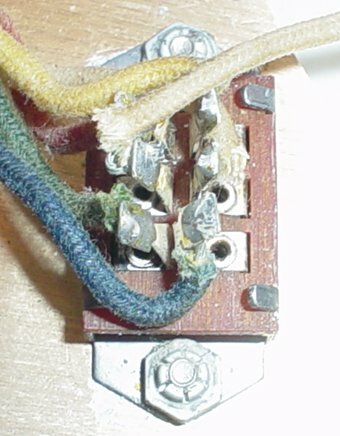 The windings switch from plain enamel to Bondable Formvar in the course of 1962. Yellow ink date stamps appear in 1964, and shortly after the black bobbin changes color to a gray fiber. The winding methods changed from a scatter machine wind, to a neater wind. 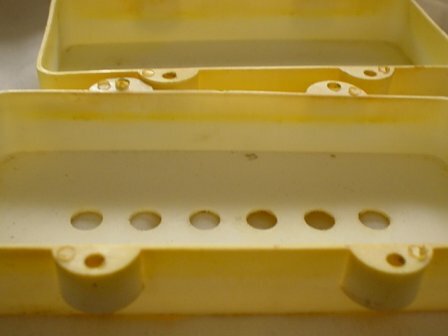 The cavity shielding plates on Jazzmaster’s change from the “tub” design that covers walls and bottoms of the cavities, to a style that just lined the bottom, much like a Jaguar. The process of change began in early 1962 with the rhythm control shield, the master controls route followed suit by 1963. The new shields are held in with glazer points stuck into the wall of the route and soldered to the brass shield. In 1962, Fender began having the potentiometers for their guitars consistently stamped with part numbers during this time. It is understandable why a factory with a growing amplifier and guitar line would implement this procedure. Around this time potentiometers made by CTS appear on occasion. Initially, they will carry the exact same part number as their Stackpole predecessor. The part coding system has roots back into the 1950's. You can read more about part codes on pots here on my pot codes section of my site. The Jazzmaster decal was redesigned in the summer 1964. The Fender portion was enlarged matching the look of the Jaguar decal. It also increased the number of Patent numbers to a total of 6 (Pat 2,573,254 2,960,900 2,817,261 2,972,923 3,143,028 DES 186,826) . There is also an alternate variety of decal made at some point mid way through the year. These decals have a white primer layer under the gold, which is visible around the edges. The gold on these logos stays very bright versus the straight gold flake used before and after this short run. An obvious other variance is the first line of patent numbers. The solid gold style has the entire line fit below "With Synchronized Floating Tremolo". The primer style has the patent number line indented on both ends. Looking at the style of manufacture of the bright gold logos with the chunkier than usual clear boarder, and usage found across the majority of the Fender line (I see the similar variation logos on Strat, Mustang, Musicmaster, Duo-Sonic, and Jaguars guitars) I am inclined to believe that CBS experimented with using a different decal supplier either in thoughts of changing the vendor, or to supplement Meyercord. . In the fall the Ivorine “clay” dots were replaced with pearloid material. The Ivorine change to pearloid transitioned over several months, and was completed by January 1965. 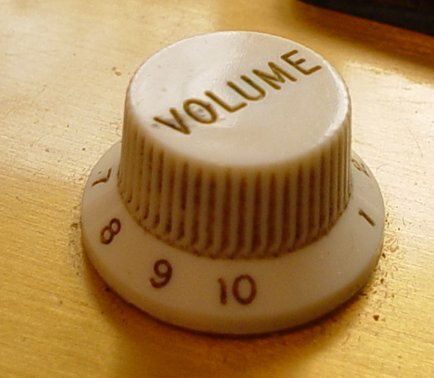 The knobs on the Jazzmaster were changed from the original Strat style to a white amp knob style with “Vol” and “tone” lettering on the metal cap in fall of 1964. The pickguard material was changed from a nitrate celluloid material to a vinyl material in early 1965, which changed the coloring of tortoise pickguards from blotchy brown and yellow to an almost purplish red color. White pickguards of celluloid aged to a mint green color now were stark white. Fender upgraded its paint facilities to allow each guitar a permanent handle through out its finishing process. The handles allowed the bodies to be attached to a rolling “tree” that allowed the bodies to dry by early 1965. 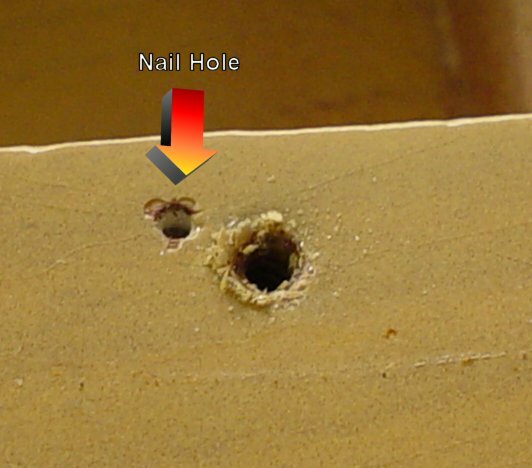 This resulted in the end of nail holes used to prop the body up during refinishing. To allow the use of previously undesirable woods with sunburst finishes, Fender began spraying the guitars with a yellow finish with a slightly opaque element similar to a blonde finish. The bodies were then sunburst finished and the result gave what is now known as the “target” or “bull’s-eye” sunburst finish. Olympic white, Candy apple red, and Lake Placid blue are painted on a regular basis. Fender was acquired by Columbia Broadcasting System January 5, 1965.. The first change was the decal. In the spring of 1965 the Jazzmaster was given a logo with 7 patent numbers (PAT 2,573,254 2,960,900 2,817,261 2,972,923 3,143,028 Des 186,826). Fender Jaguar decals changed as well adding one patent number (DES 186,826 PAT. 2,960,900 2,972,923 3,143,028 & PAT. PEND). Binding is added to the necks by mid-late August 1965. Initially the binding was slightly shorter and thinner. 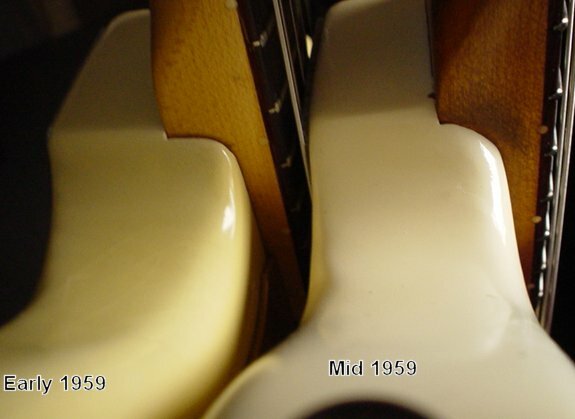 The headstocks on both guitars were enlarged to the ambiguous CBS larger headstock shape by November as well as increased size of the binding. Around the same time Fender began installing “F” branded tuners made in-house with a transition of a few months on Jaguar’s. The frets tend to be wider in this era than ever before in Fender history. Briefly the Jaguar had a 7 patent number decal running in two lines. There only appears to have been one batch of these used and the decal quickly changed to a 5 patent number configuration (PAT. 2,960,900 2,972.923 3,143,028 2,741,146 DES. 186,826 PAT. PEND). Fender announced in the 1966 catalog that the Stratocaster guitar was going to feature a bound neck. Fender scrapped the idea and now bound neck Stratocaster’s are very rare. However there is evidence that Fender may have made up a pre-production inventory of bound necks before making a change in plans. Because the necks are identical to a Jazzmaster in terms of scale and headstock shape, they appear to have been used up on Jazzmaster’s. These usually have January and February dates as well as the Stratocaster part code of 13. Jazzmaster’s were made with both Fender made and Kluson tuners through most of the first half of 1966. 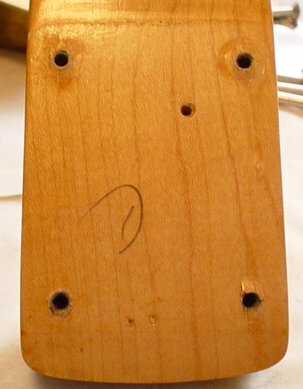 Many of the earliest of the “F” tuner equipped necks were manufactured with the old Kluson pin router templates. Workers simply doweled the two outer “E” tuner holes with walnut and drilled the necks for the newer style tuner. One can spot a factory job from a later modification two ways. The factory walnut dowels are under the original finish and no screws ever went into the pilot holes, so they appear to be a bit smaller than usual. 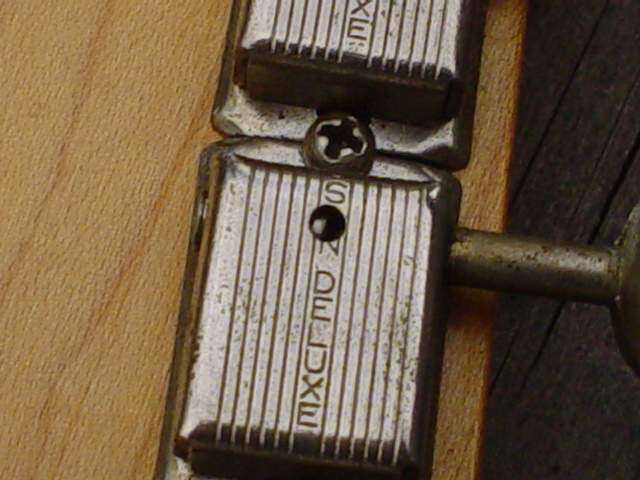 Kluson tuners appear as late as the early block inlay necks. Then we see a Jaguar decal with 7 patent numbers (DES 186,826 PAT 2,960,900 2,972,923, 3,143,028 2,817,261 2,741,146 & PAT PEND), the Jazzmaster had three different decals used at once for a very brief period of time. CBS Fender had decided the old type “A” transfers applied over the finish were not durable above the lacquer, so it was decided a version applied under the lacquer would hold up much better. It was also decided that the lettering should be increased in size perhaps to make the brand and model name more prominent on TV and in photographs. In early 1966 Fender experimented with two type “C” transfers on the Jazzmaster, both would only appear on select custom colors. For the lighter custom colors such as Sonic Blue, and Ice Blue Metallic, the black CBS Jazzmaster logo appeared. These decals feature 6 patent numbers (PAT 2,573,254 2,960,900 2,817,261 2,972,923 3,143,028 Des 186,826). This CBS logo is almost identical to the ones used from 1967 onward, but lack the â after Fender. On darker custom colors such as Charcoal Frost Metallic and black, an all gold version of the CBS Jazzmaster decal was used to contrast the darker color. This decal resembles a Coronado, or Fender Kingman logo. It features 5 patent numbers. Sunburst, blonde and Olympic white Jazzmaster’s used the old style Type “A” transfer. This experimentation with the decals was very short lived. Most guitars found with this system of labeling have February 1966 stamps. There are no strict rules with this system. There appear to have been Olympic white guitars made with the black CBS logo, and some metallic finishes have the older over the finish decal. The new CBS logo was then briefly discontinued from standard use and does not reappear until the type “A” decal is completely phased out in 1967. The later version features an “R” in a circle after “Fender”. 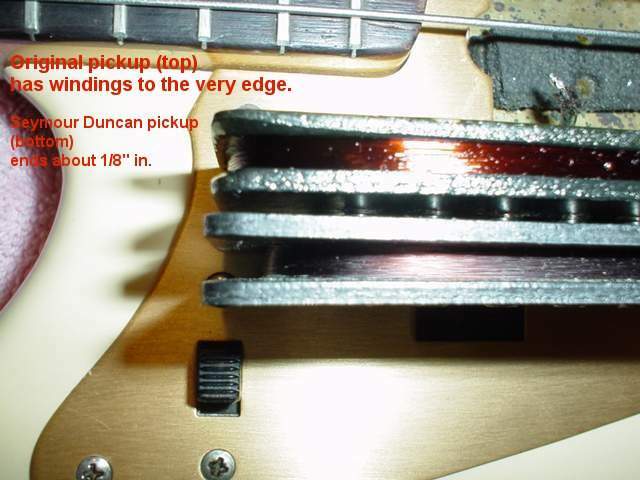 The pickups changed in this era in that the factory began winding them with a winding wire known as “Bondable Polyurethane” winding wire that is potted using a denatured alcohol solution. This wire is commonly known as Polysol. The alcohol doesn’t penetrate the coil so these pickups tend to be a little microphonic. Factory insiders claim this era the pickup magnet material was changed to a more cost conscious formula. The pickups from this era tend to sound a little different from earlier pickups, often described as sounding darker. 1958-April 1959 we see a handwritten pencil date. April 1959-early 1960. It appears the suspension of handwritten dates started around April 1959. Occasionally we see a date pop up until August, but after that, they are almost never seen. The system seems to reappear in very early 1960, but I am not exactly sure when. I would say that it became a regular item by February or March 1960. This was likely something that transitioned in and out so there are overlaps of the styles going in and out. A= The part number for the neck. From 1962-the end of 1965 the code is "4". Then the code changes to a Stratocaster code of "13" by the start of January 1966. Once in a while a "4" code still pops up. The "13" code lasts well into 1966 and the code "19" becomes the 'official' code during the year. Slowly this number become the standard code by 1967. To add more confusion, I have also seen stock mid-late 1966 Jazzmasters with "10" codes. The problem here is this is a Coronado neck code and this may tempt many builders to try to pass a Coronado neck as a Jazzmaster. The key info here is a Jazzmaster neck with this code will have a full sized large CBS headstock. If it looks like a Coronado headstock or like an older smaller Jazzmaster headstock, then the neck is not a Jazzmaster neck. 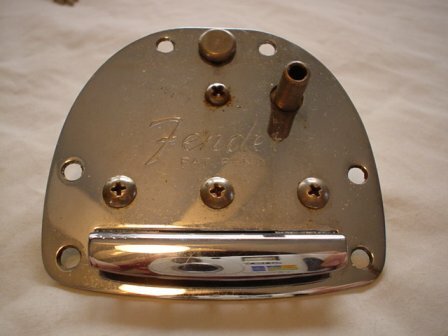 · 1965-1975 Fender made “F” Tuners. Earliest F tuner equipped guitars feature Kluson tuner hole piloted necks with factory filled screw pilot holes. There are also a small number of Jazzmasters with factory equipped Grover tuners. These tuners have a square pearloid button and a hand engraved F on the rear cap of the housing. These necks usually have a veneer on the rear hiding the doweled F tuner pilot holes. · Pre-Production models have a headstock with a unique shape that looks like a cross between a Jaguar headstock and a CBS large headstock. · 1958-early 1966 slightly larger than a Stratocaster headstock. Leftover stock can be found on occasion well into 1966. · 1966-end CBS large style headstock is used. 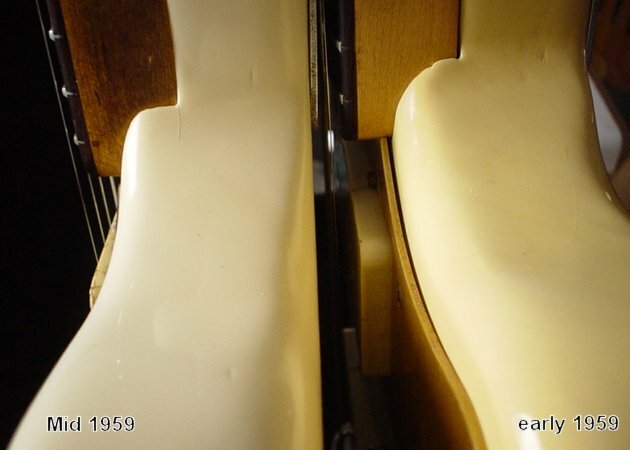 Starting in 1964 we see the thickness of the headstock gradually increase. The theory is Leo thought that by bulking up the thickness he would prevent warpage of the head. The truth is more likely that he was trying to fix a problem Fender heads would occasionally have of cracking and splitting around and through the tuning keys. During 1965 we see the tuners move farther away from the headstock edge closer to the inside of the headstock, perhaps to give added wood on that side as well. · Early-mid 1966 Jazzmaster can be found with three different decals. Sunburst, blonde, and olympic white guitars use the 7 patent number transition logo. Light toned custom colors such as Ice Blue metallic, Inca silver and the like have the earliest use of under the finish “CBS” black logos with larger lettering and 6 patent numbers PAT 2,573,254 2,960,900 2,817,261 2,972,923 3,143,028 Des 186,826. Darker custom colors like black, charcoal frost, Ocean Turquoise, etc use a CBS logo with "Fender Jazzmaster Offset Contour Body Pat Pending" in gold and the rest in black. .
1967-1976 we see the CBS logo with an R after fender used consistently. 1958-1959 Bodies are made of 2-three pieces of alder. Ash bodies used on blondes and some very early sunburst employee guitars. Controls route is made with clean lines. 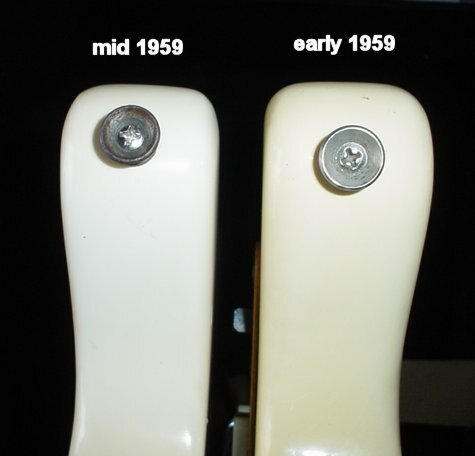 1959-1962 Controls route is changed to accept the extra screw holes used on the celluloid pickguard models. The body thickness changes to a slightly thinner style by mid 1959. 1965-1967 Nail holes are done away with. Bodies now usually are made of 3-4 pieces with occasional bodies veneered to hide butcher block style heavy laminations. 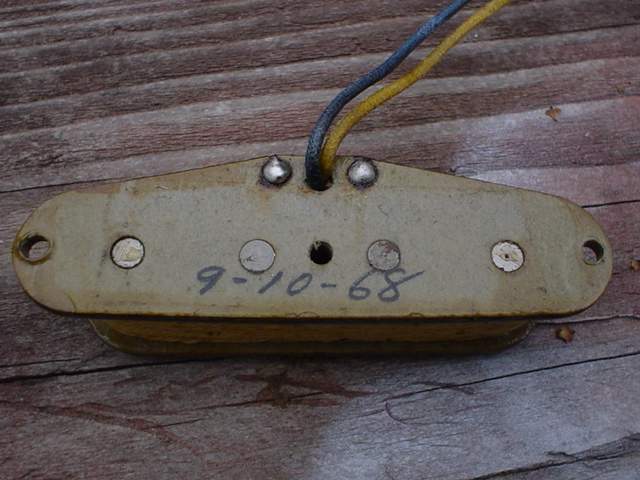 1958-1961 Dates are usually located in the bridge pickup route. 1967-1970's Date codes are usually found in the neck pocket, but are not always present. They can appear in various routes, so look around. Jazzmaster pickups have been hard for me to pin-point spec wise. There are more variations with Pre-CBS Jazzmaster pickups than most any other Fender from the same era. Here are some general specs. 1958-1962 The pickups were wound with plain enamel wire. They were potted in an alcohol activated material. The windings fill up the entire bobbin and often slightly rub the pickup cover. The magnets were hand beveled and the magnets barely stick out beyond the cover. On the bottom the magnets stock out quite a bit and have a heavy bevel. Both neck and bridge pickups have black and white cloth wire and the fiber for the coils is made from black material. 1962-1964 The winding wire appears to change to bondable Formvar and is still potted with the alcohol activated material. The winding style changes during 1962 from a 'scatter wind' to a more even wind. 1964-1966 The fiber changes to a gray color and dates are applied to the bobbins. First the dates are a small stamp with the Month, day, year and initials of winder. These appear on the end of the black bobbin pickups and overlap to the early grays. Then the dates were penciled in, but by the end of '64 and early '65, we see the typical black marker style of dating. I have seen some early gray bobbins with standard Formvar winds wax potted. 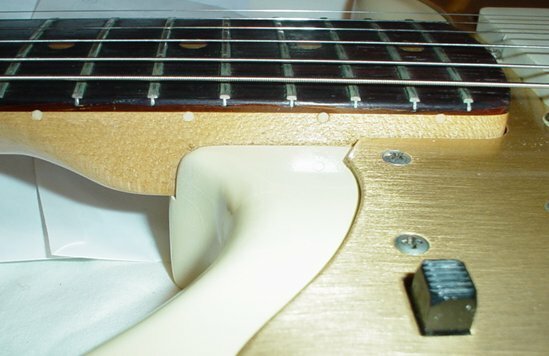 During 1966 Fender started using Polysol winds. This has the same alcohol based potting solution as the Plain enamel and Bondable Formvar, but on this wire the potting material is manufactured right on the wire. 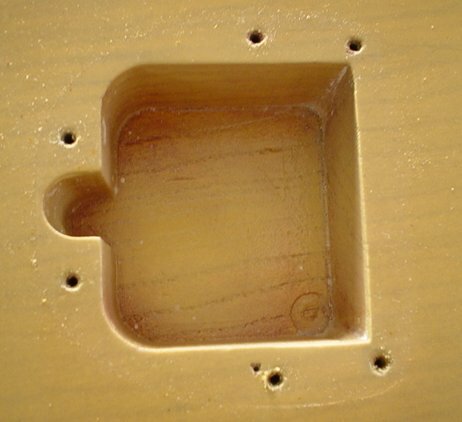 The proper way to use this material is to allow the wind to run through an alcohol saturated sponge so the pickup pots itself as it is wound. This must have been a problem for the multiple coil winding machines, so Fender potted them at the end of winding. Some appear to be dipped in the solvent, others appear to have been heated up. I believe that the bonding material used on all of these wires is blonde shellac based. There are some exceptions to the above system. I have seen some late 70's pickups where it appears the week code and batch code get swapped around. For referance, here are some comparisons of Seymour Duncan Jazzmaster reissue pickup next to a genuine Fender 1959. The shielding changed a few times in the first 6 years of the guitars production. Earliest models have 'tubbed' style shields in both controls routes. 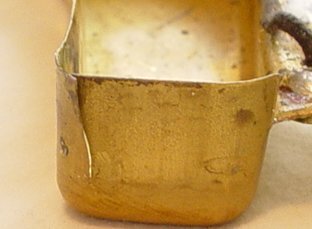 These have a bit of brass that lines the walls of the cavity as well as the walls. This first style grounded to the bridge by a guitar string that was placed in the thimble hole and bent to make contact with the pickguard. Second generation styles had a V notch cut into the master control tub with a black (sometimes green in mid 60's) wire running to the tailpiece route. The wire was grounded via a staple on the face of the guitar below the tailpiece mounting plate. The tub design first changed with the rhythm controls section in 1962. This plate became flat like the pickup plates and was attached with Glazier points. Between 1963 and 1964 the master control shield became flat as well. The first anodized pickguards had shielding properties built right in. A worker would clean off anodizing under the controls and by the bridge thimbles to ground everything. 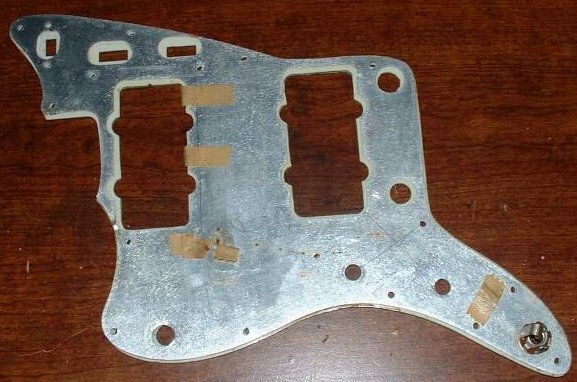 Early celluloid pickguard models use a shield that is stamped out of sheet aluminum using the exact same die as the pickguard. Most notably the riller knob and upper switch slots are cut into perfect rectangles. The second style shield appears by late 1961 and is similar to the first style, but has oval shaped holes by the roller knobs. By the early 1970's the shields became aluminum tape stuck to the rear of the pickguards. New USA reissue shields are alot like the first style shield, but the holes for the rollers are slightly larger and the material is slightly thicker. The tremolo tailpieces only went through one significant change. The original units are notable for their "Pat Pending" stamp below Fender. During the late 1961 -very early 1962 timeframe we see the switch to a patent number 2,972,923. This is a very important number as the number never changed on real Fender guitars. 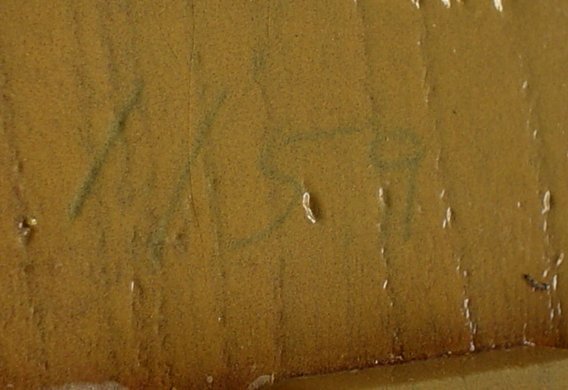 This number is almost always wrong on Asian forgeries made back in the 60's and 70's. I have seen real Fender's end up with the fake plates over the years! The tremolo arm itself changed little over the years. Earlier units have a heavier chrome plating than 1960's models. Before 1963 they also tend to have a more graceful bend whereas later on during heavy production 2 sharp bends appear. The spring did change along with the introduction of the Patent number. Earlier springs had one more coil wrap and were designed just for the then standard heavy gauge flatwounds on the full 25 1/2" scale. The spring was too stiff for the Jaguar, so to standardize they shortened the spring by one coil. This makes for a slightly different feel and action. The screws used for mounting the tailpiece are slightly smaller than strap button screws. Modern screws tend to be too large, which is something top look for if you are trying to determine if your guitar was cobbled together. The original screws fit the tailpiece plate perfectly. Up until 1961 the screws usually have a thread that only runs up halfway the screw wire. After that the threads run right up to the head. The finish has gone through a few changes during the course of the Jazzmasters life. In the 1950's sunburst bodies were first bleached, dipped in a yellowish/amber stain, sealed with a homoclad sealer, sunburst finished, then clear coated. By the time the Jazzmaster came around the factory already had begun using red pigment in the sunburst patterns, but often this red fades. The other sunburst bands range from a medium brown to a dark, almost black shade of brown called "Dark Salem". Because of fading and age bodies will often look 3 tone on the face and 4 tone on the rear. It isn't uncommon to find 4 tone looking sunbursts on the entire guitar (Dark salem, brick toned brownish red, red, yellow). By 1962 the factory started using what is now known as the "Fullerplast" sealer in place of the homoclad sealer. This finish is a catalyzed finish much like polyester. The factory could spray two coats and start applying the color coats within a day. The checking of these finishes is a little different compared to the homoclad sealed bodies. we also see less of the medium brick brown color component and more true 3 tone sunbursts. The paint stick method of body suspension appears as well, but nail holes are still used for suspending the bodies during final curing. In 1964 things start to change. It appears that along with the upgrade of body suspension we see the factory likely started upgrading spray equipment as well. Earlier sunbursts were done with a medium/heavy spray tip which created large droplets of paint in the burst pattern and created lots of overspray that usually ended up in the center of the body. This overspray would darken the yellow center. The newer tips were a medium/fine style and create a finer, more precise sunburst pattern. It also reduced the amount of overspray ending up in the center, which gives the yellow a stronger, more vibrant appearance. CBS came in 1965 and used its money to further upgrade the paint system. More rolling trees and paint handles were made, so nails were no longer needed. The bodies started out on sticks and stayed on them until they were completed. We also see the start of the CBS influence with the usage of less than visually appealing woods on sunburst bodies (Leo used these for solid colors in years past). 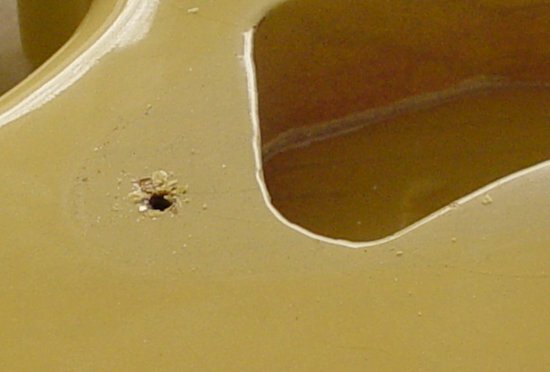 The company started by adding a semi-opaque (think blonde) yellow finish over the yellow stained and Fullerplast sealed body. This wash coat helped hide stains in the wood, and bad wood matches. It also further intensified the yellow layer and thus the 'target burst' was born. A little know style of sunburst finish they experimented with between 1966-1967 was what I call a 'faux burst'. The body of the guitar is generally made up of 4-6 pieces of wood, veneered on the face and back, sealed with Fullerplast, primered white, glazed to simulate wood grain, then sunburst finished. We also see a change in lacquer formulation in 1965. I am not so sure it was a cheaper lacquer, but it does appear to be perhaps an early variation of what is today called 'musical instrument grade' lacquer. It contains more plasticizers to prevent premature checking. This lacquer gains a very orange/amber look when exposed to lots of UV's. It even feels a bit sticky even today. This lacquer is what has distorted many of the custom colors we find today. It makes LPB look like a dark green, Ocean Turquoise looks more like Charcoal Frost/Caddy Green, etc. Most necks that were played much with this finish are usually worn right down to the wood. 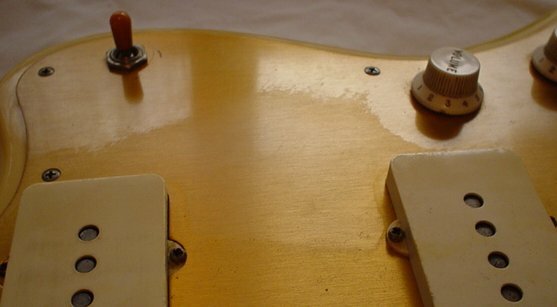 In 1967 we see Fender began using polyurethane finishes. Insiders say that nitrocellulose and acrylic lacquer was still used for the color coats. Polyurethane is a great finish which is thin, yet durable. The myth of "poly means thick, unmusical finish" is based on the polyester finishes the company started using in the mid-1970's. 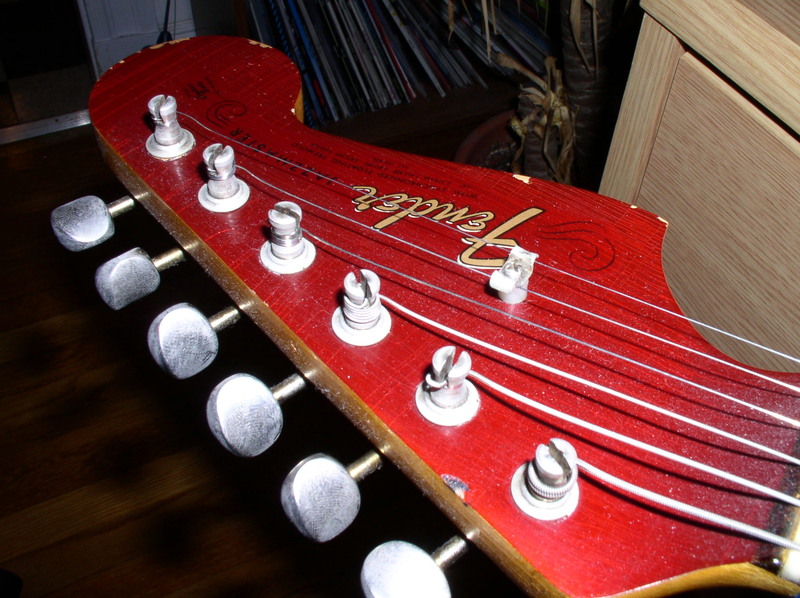 It is quite common to find a nitrocellulose finished headstock face during this time as the Type C decals didn't like to work with the polyurethane. You will also occasionally find a all nitrocellulose finished neck, more commonly on low end guitars and basses like the Musicmaster family. An interesting item I personally discovered when stripping and refinishing late 60's-70's necks is that the finish does not permeate the wood like lacquer. When this finish is stripped the wood below is dry and virgin. Lacquer finished necks soak up a bit of finish before the finish builds up. 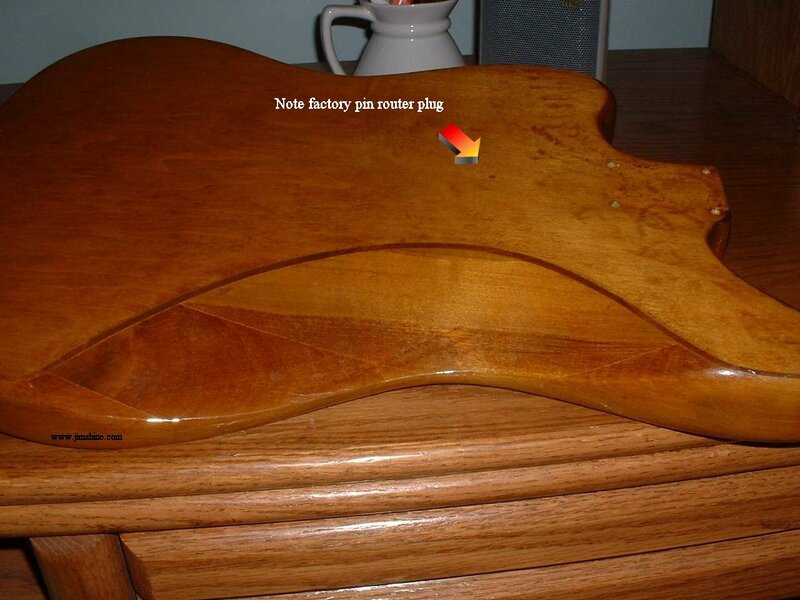 This is likely why maple fretboard models tend to have peeling finish. The finish sits on the wood rather than bonding with the wood. Factory refinishing was an option at Fender through the 1960's. Jazzmaster and Jaguar guitars were top of the line instruments at the time, so this option was used frequently when the owner started to wear their guitar out, or wanted to change the color and upgrade to a Custom Color. These guitars are very hard to spot as being refins as the factory applied them and after 35-40 years of age, they look 100% authentic. There are markings that will tip you off if it is a factory refinish. The bodies and/or neck will have a number code burned into the wood and often the color will be initialed or written out as well. Pre-1966 refins have the numbers and color crudely etched in with a soldering iron done freehand. Often in this era the numbers match an invoice at the factory or full serial number. 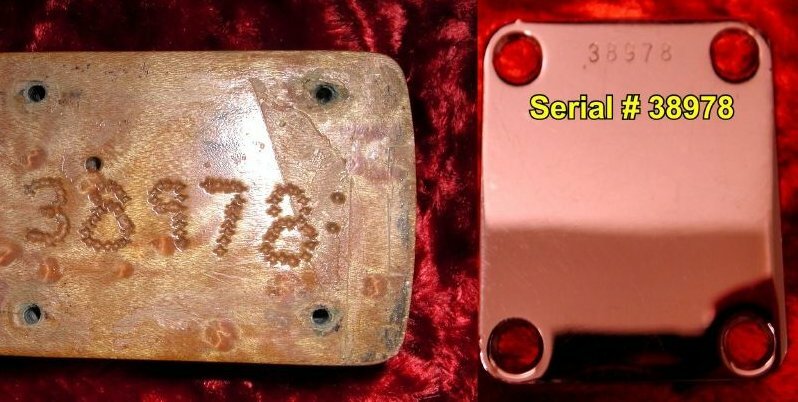 In 1966 we see a metal stamp used to number code the bodies and the refin color name. The numbers in this era often match the last 3-4 digits of the serial number of the guitar. There are exceptions and it appears that the serial number code and work order invoice code were used intermittently. Other clues as to when the refin was performed can be found in the pickups and/or pots. The factory usually changed one or both of these items, but not in every case. There is evidence that on occasion Fender would change the body or the neck when they did a refin. This was likely done when a neck had worn frets, or a body had large dents and dings that didn't easily sand out. Often the replacement part will not have the branding, but I haven't seen enough to come up with a definitive conclusion as to how they marked them as a standard. UPDATE- I have now seen a 100% legit 1954 Stratocaster factory refinished in 1959. So the factory was doing them at least that far back. The body was branded with the serial number, like the Jazzmaster example below, so I am now inclined to believe the serial number system was the first used followed by invoice later on. There are a couple of stamps I should mention real quick. On some mid-60's guitars the necks and sometimes bodies are stamped "SPECIAL", "DEMO", or "NAMM". Special stamps are by far the most common of all and are likely promotional instruments given away by Fender. Demo stamped guitars were likely salesman samples they took on the road to show dealers. NAMM stamped guitars were for exhibition at the NAMM shows. All of these guitars appear to be standard instruments with no special attention or specs. These stamps tend to appear on 1966-1967 Coronado and Electric 12 instruments (first years of production, so the promotion for those was heavy), but I have seen them on all models at least once. Cases for these guitars run along the same rules as other Fender guitars made the same years. I will do a general run down of the styles. Before that I would like to mention that it is very common to have an inappropriate case that has been with your guitar maybe its entire life. The reason this is possible is mainly because of music stores. These guitars were very popular in the 1960's and music stores had them coming and going. If a guitar sat for any length of time, when it finally sold they would just go out back and grab a case that fit, not caring if the color changed (in fact they may even make the deal sound better telling the customer they are getting one of the hot off the line new case colors). When sold used, a store would often have several of these guitars hanging when nobody cared for them. The employee would go out back and again grab whatever fit. This is how tweeds end up with later guitars and 59's end up with black cases. There was also a cheap gig bag made out of tolex offered. Many people likely upgraded to a real case after a while making the case color wrong for the era of the guitar. 1958-fall1959 Tweed Style with Gold interior. These have gold hardware as well. 1961-1963 Brown tolex. This era has lots of changes that overlap each other. Chrome Cheney latches (what we see today on reissues) begin, interior changes to orange, center latch moves out from under the handle. 1963-mid 64 White Tolex, orange interior Black ends. It appears that some dark green ends appear on some cases. 1972-to the end The logo loses the tail again. The interior varies quite a bit too. Some range from bright orange short piled to old style golden orange with medium pile. I have seen at least 3 different linings used in the different cases, so expect any variation here. Now for the weird stuff. 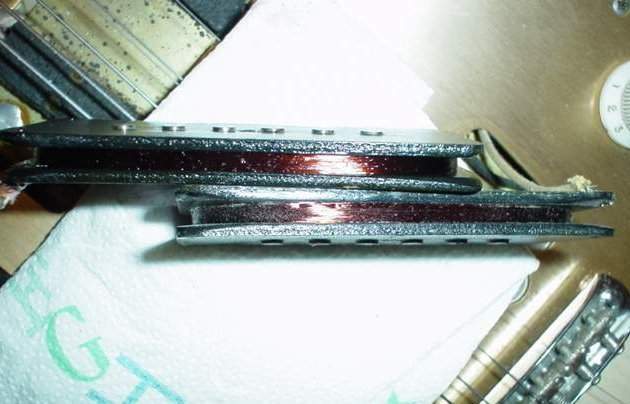 Around late 1964 we see some items come out to enhance your Jazzmaster. In the long run they were just gimmicks, but they are interesting as once in a while we see a vintage Jazzmaster still retaining these items. The first was the Fender "Body-Guard" made by Parker. This was a plastic shell molded with a Tolex style grain. It covered the rear and edges of the guitar. The strap buttons would hold it on. They came in clear, red, white, and black. The idea was great, especially for Jazzmasters where you wouldn't have to get to the back of the guitar for string changes. The biggest problem was the rubber gasket (usually long gone by now) was made from the same stuff we see Jaguar mutes and the pickups shimmed with. This stuff breaks down to an oily mess that eats paint. Most Jazzmasters that had these on them have major finish damage to the edges of the guitar from this rubber breaking down. Typically I see mid 60's factory refins with these. One guy I know who had a refin done told me the Body-Guard came on the guitar when he got it back. The only real changes I see in these is the grain goes from a Tolex style (most common) to a frosted style at the end. Parker looks to have continued to make these after their deal with Fender was done. I have seen non-Fender branded versions with just the Parker name and a squiggly logo. The Go-Round belt was a guitar strap that was worn like a belt. You used to eyelets installed to the rear of the guitar to attach the belt. I have only seen one Jazzmaster modified for this rig, but the belt was long gone. 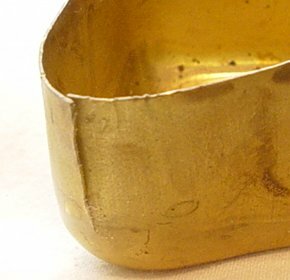 The "Pick-Guard" is perhaps the least known about items as it was never advertised. This was a removable vinyl sticker that you applied to the treble side of your pickguard that helped minimize scratches. These 60's versions were a white/cream backing with a large "Fender" logo screened in a maroon color (likely to kind of match the typical tortoise guards). I believe this was a CBS attempt to get the logo more visible for television, like Mosrite did on their pickguards. I do not believe these are pre-CBS. Only one music store retailer I spoke to remembers them. He remembered them being more of a promotional item and only received one box of various styles. The only one I have seen in an old picture is on the Jaguar Muddy Waters is holding wearing a Santa hat. Even Rosco P. Coltrane loves Jazzmasters!